We read a very short, candy corn themed, story for stART (a story+ART link-up hosted by A Mommy's Adventures), today. 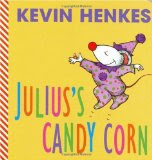 Julius's Candy Corn, came from our library, as part of a boxed set, entitled - A Box of Treats, Five Little Picture Books by Kevin Henkes. Each of the five books, has an appropriately sweet, candy theme, to go with various seasons, and holidays. In Julius's Candy Corn, Julius is instructed not to eat any of the ten cupcakes, on the table, each with a candy corn on top. They are for the party. And, he doesn't eat...the cupcakes. It's a very simple story, but my youngest two (ages 4 and 5) thought it was very cute. We made an equally simple, contact, and tissue paper, craft to go with it. I traced 10 candy corn shapes, on the back side of contact paper, using a template from a First School, printable, candy corn craft. Then, we cut them out, and peeled the paper away (E was able to cut, and peel them, herself). I sat them sticky side up, over the template (for C), and the girls covered them with pieces of yellow, orange, and white tissue paper. When they were done with all ten, I trimmed them, and hung them up on the window with tape. I know I've seen this done, where a second piece of contact paper is used to seal in the tissue paper, but the girls had pretty well covered all the sticky parts, so I just hung them up, as they were. For more story stretching, arts and crafts, click over to this week's stART link-up, at a Mommy's Adventures. Very cute. Sometimes I use the second piece of contact paper to preserve the suncatchers if I want to keep them to use in the future. We are going to be making some pumpkin contact paper and tissue paper suncatchers for our October story hour. It's such a simple craft and yet the end result is always so nice. Very cute! I love tissue paper window decorations! We did this last year on our candy corn theme day. I LOVE how they look with all the fall leaves in the background. So cute! I bet my kids would love to do this! I've got Owen and the marshmallow chick in board book, now I'll need to look for the others. These are so cute. I will have to remember these, we hesitate in decorating our windows this time of year. I can't believe how many parents will even allow children to come to a door with all the lights turned off. This is such a cute craft. I can see my son eating just the candy off the cupcakes. What a great idea, these are super cute! Thanks so much, I'll be linking.